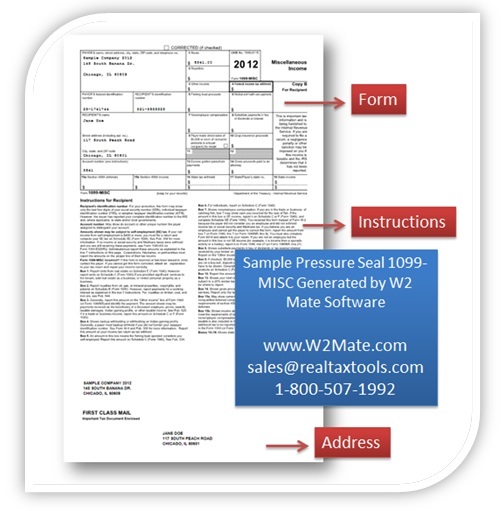 Our W2 Mate (W2 1099 software) now supports the ability to print 1099 MISC Pressure Seal forms. Top part is the 1099-MISC copy B form (for the recipient). The middle part is the instructions for the recipient. The third (bottom part) includes the filer (sender) and recipient addresses. This new feature inside W2 Mate is attractive to users processing volumes of 1099 Miscellaneous Income forms. Using a pressure seal system helps filers maximize volume while minimizing processing time and cost. The screenshot below shows the anatomy of a Pressure Seal 1099 MISC form generated by W2 Mate. Click here to learn more about W2 Mate and its W2 1099 printing capabilities.